"OMG HOW AWESOME IS THIS!?!?" The tree is a great user interface for file management... but it quickly becomes a problem when it's too large. And isn't it always too large? Much too large?? How many of the displayed folders do you really need to see? 20%? 10%? Maybe just 5 out of 400? Well, here's a killer feature for you: Mini Tree! It's an extremely simple idea, but it might change your way of browsing the file system forever: The Mini Tree displays only the paths you have actually used. This makes browsing blindingly fast (it's instantaneous even with deeply nested subfolders), it makes the tree ridiculously small, and it makes you feel like being back in control (because you look at just the folders you are actually using, instead of being avalanched by all the folders that have accumulated on your drives over the years). Believe me, my tree is really big: Lots of local drives, mapped drives, Network, and thousands of folders everywhere. However, when I work on XYplorer (which is what I do most of the day) I just need the Mini Tree you see above! Relaxing, isn't it? The Mini Tree is distinguished from the normal tree by inverted (white-on-blue) plus/minus icons. 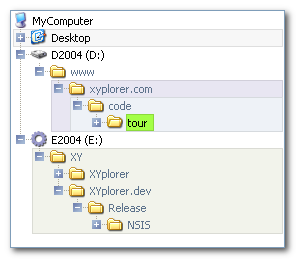 The Mini Tree is retained across sessions: When you start XYplorer on Monday you'll look at exactly the same tree you left Friday afternoon. You can easily hide folders from the Mini Tree via the context menu command "Hide Folder from Mini Tree". There's Scripting command loadtree by which you can load a previously stored Mini Tree, add folders to it, or remove folders from it. 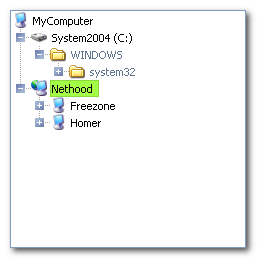 The Catalog supports storing and restoring Mini Trees via its context menu. There's a toolbar button "Mini Tree" which works as a one-click toggle between Mini Tree and normal tree (Maxi Tree). The button also features a context menu with a couple of related commands. This page has been written 2008-12-03. The screenshots don’t reflect the current look of the application. Some of the functionality might have been changed or enhanced in the current version.